With warm, crystal clear waters and amazing sights to be seen including caves, coral reefs, shipwrecks, and beautiful tropical fish, there is a whole underwater world just waiting to be explored when you go on a St. John scuba diving adventure. And there is plenty to explore! There are over a dozen St. John dive sites, including a few shared with the island of St. Thomas and the British Virgin Islands. Diving in the U.S. Virgin Islands is ideal for both beginners and experienced scuba divers looking for a new perspective. 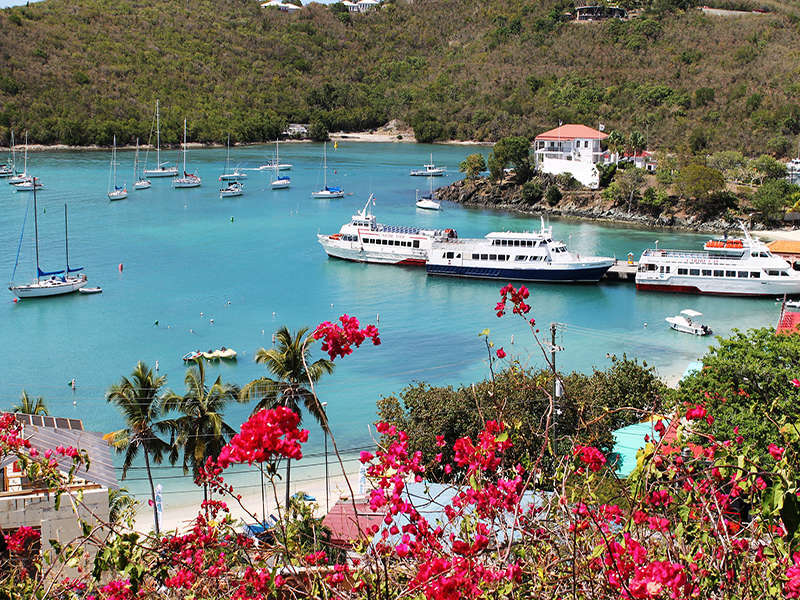 Check out this list of the 5 best places to experience St. John scuba diving! For more information on outdoor activities you can enjoy during your CimmaronStJohn vacation, read about our recommended local eco-tours and water sport outfitters ! You will love St. John scuba diving, snorkeling, kayaking, paddleboarding, and other exciting escapades. One thing to remember for St. John scuba diving is that you do need to be a certified diver. If you are not certified, check out a dive with Low Key Watersports and their Discover Scuba Dive. Low Key Watersports in St. John offers inexperienced divers an instructional introductory course and then a shallow dive with one of their instructors. Participants must be at least 10 years old to dive. Known as one of the best wreck dives in the Caribbean, the Wreck of the Rhone is a popular, historic dive near St. John. The Rhone was a 367-foot merchantman sail-steamer that sank in 1867 as the result of a hurricane. Now, this dive spot can be found in the calm waters of Salt Cay. Movie goers will also recognize this location as the site of where The Deep was filmed. On the western tip of St. John is Carval Rock. This dive boasts incredible views of tropical fish, including sharks and steep rock formations in up to 80 feet of water. Because of the strong currents at Carval Rock, beginner divers should probably steer clear of this specific dive. Head west from Carval Rock and explore the many grottoes of Congo Cay. The combination of soft coral and the abundant amount of reef fish make Congo Cay a feast for the eyes. One particularly great thing about Congo Cay is that there are shallow areas for beginners as well as deeper crevices. Divers should be able to see not only tropical fish but turtles and sharks as well. There are also ancient Taino rock carvings at Congo Cay alongside a freshwater pool in the Reef Bay Valley, if you’re looking for a land adventure as well! One wonderful area to experience St. John scuba diving is Grass Cay. Grass Cay is a hot spot for adventurous divers who want to experience night diving. After the sun sets, lobsters, crabs, and octopus make appearances that are rare during the daytime hours. Grass Cay is worth the trip for the array of sea life found in this beautiful location! While you’re on vacation, there is no need to bring all of your diving equipment. Both Low Key Watersports and Cruz Bay Watersports in St. John have scheduled dives that include all equipment with the exception of the wetsuit. With dives departing daily, Cruz Bay Watersports offers a Two-Tank Morning Dive. This opportunity features two dive locations with 45 minutes spent at each destination. Cruz Bay Watersports also offers a night dive perfect for beginners. After a day spent experiencing St. John scuba diving, you’ll need the perfect spot to kick back, relax, and enjoy the sea breeze. Here at CimmaronStJohn, we have everything from a scenic two-bedroom condo to a gorgeous 6-bedroom villa to make your vacation dreams come true. Let us help plan your trip to our beautiful island! Just call us at 340-715-2666 to get started on your amazing vacation in the Virgin Islands.